Ideal to measure torque on bolt and using the Centor technology, the digital torque gauge Centor TW with wrench sensor has a very large graphic display and shows a maximum amount of information for more efficient torque measurement. 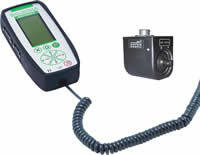 The torque tester Centor TH, with its handle torque sensor, is an instrument designed to measure manually torque on screws, bolts, tools... directly in production. Mounted with a standard reaction torque sensor, the torque gauge Centor TT is ideal to be integrated on a bench or tester to perform accurate and repetitive torque measurements.